If you follow me on Twitter and you participate in the #bblogers chats, then you know that I rave about MAC Rebel a lot. The sad thing though is that I accidently left mine in my car the other day and it melted so it’s now ruined! :( Therefore I need to get a new one because this definite is my go-to pick-me-up shade and I really miss it being on my lips! Rebel is a rich, deep, fuchsia berry color, which has a lovely glossy finish. It is super opaque and I find that it’s not as drying as many other MAC lipsticks tend to be, which gets big thumbs up from me. If you’ve never seen this shade before, go check it out because it is seriously gorgeous, especially if you like bold colors. So loves, this is pretty much everything I am hoping to get for my birthday this year but with or without these products I am sure I will be having a blast, surrounded by my loved ones! <3 Hope you are having a great weekend! Everytime I'm at a beauty store I'm lurking around the Chanel counter for ages just to look at Les Beiges but somehow I still haven't bought it. Yet. I know I will be, but perhaps next month or so. It's not like I have just bought a red MAC lipstick but you make Rebel sound so gorgeous I'll be checking it out next time I'm in town. I got the Bumble and Bumble Surf Spray for my birthday last week and love it! The new shampoo from that range is great to use with it too. Have a lovely birthday on the 12th!! very nice wish list ! Both of those blushes are beautiful! I love the look of Rebel and have wanted it for ages! I'm not that into blushes, but the Dior looks stunning! 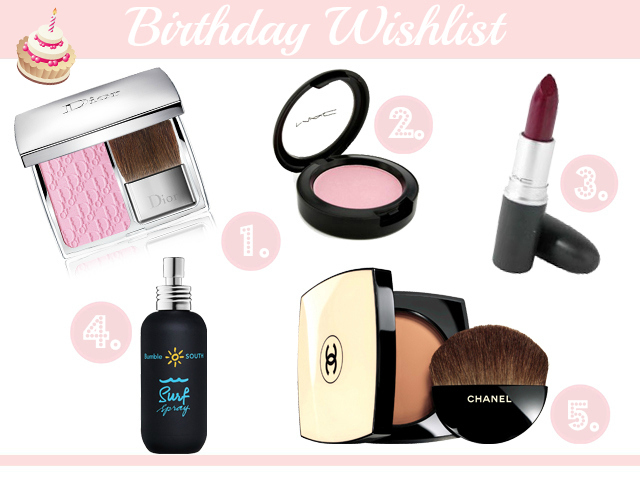 everything on your wishlist looks great, love the Dior blush & Chanel powder, hope you get them all! Happy Birthday! My birthday is the 10th of July! Great wish list! I love MAC well dressed blush, it is on my wish list as well as the Dior Blush and Chanel Blush! I have the Bumble and Bumble Surf Spray, it is fab! Great wish list, you can't beat Chanel. I always ask for Chanel for my Birthday and Christmas, such a nice treat to unwrap! I love MAC Well Dressed blush, it's so lovely! I can't believe it's sold out everywhere, though, that's such a bummer. I hope you'll be able to find it for your birthday! Great wishlist! I've been eyeing Well Dressed for the longest time. Amazing wishlist, i would love all of those things. That Dior blush looks amazing! I was debating on doing a post like this, but never came around to it :/ ..
Soooo wanna get my hands in the DIOR Blush - it's so beautiful! This is a great wish list!! Hopefully you will be getting something off of your wishlist! !